I mated on Justified today to get in a quick 8 hour shark trip in the DE Bay. We had a fun family on the boat with 4 kids and it was a blast. We released 5 sand tigers and 3 brown sharks. They all did awesome on the rod and reel and lots of laughs. Marlin mode tomorrow for the Stone Harbor Invitational Marlin Tournament. Prep day and moving Exile65 to the Canyon Club and at it on Friday. With the perfect weather we slipped out for a quick afternoon trip to explore for some bluefin tuna on the troll aboard the Trade In. 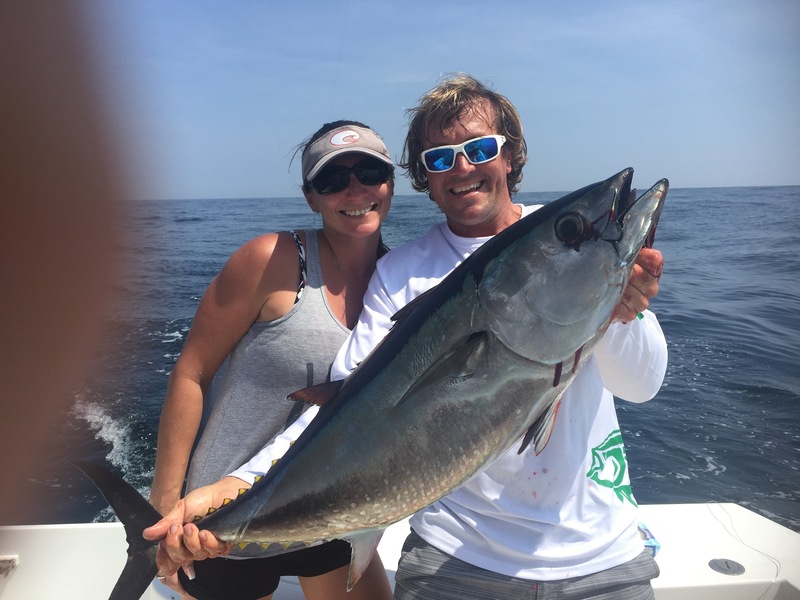 We setup on the troll on an inshore lump and after about 30 minutes got into an under bluefin (40″) on the way back Downs Blue Tuna Flare and Kristie got her first personal bluefin tuna! Congrats! We also had a double header on the other way back blue and white 3 oz. 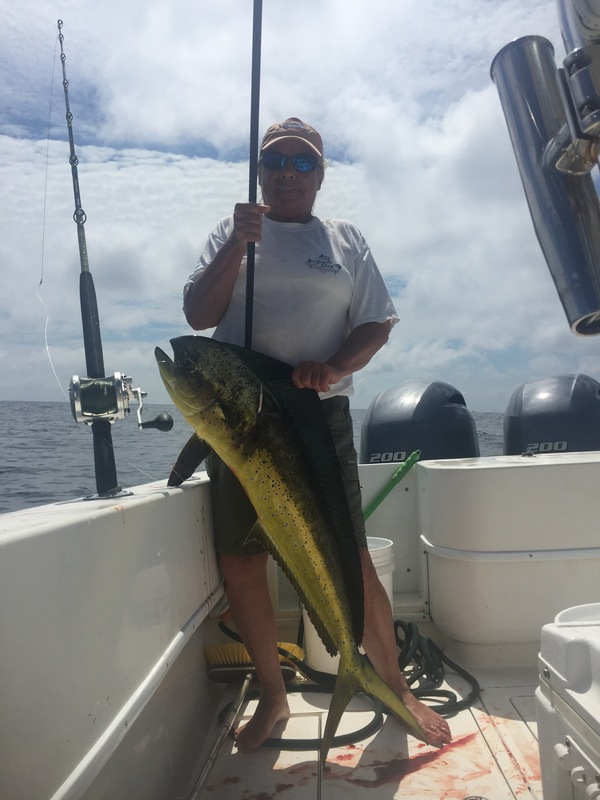 Joe Shute with a mahi-mahi that we got into the boat as well. 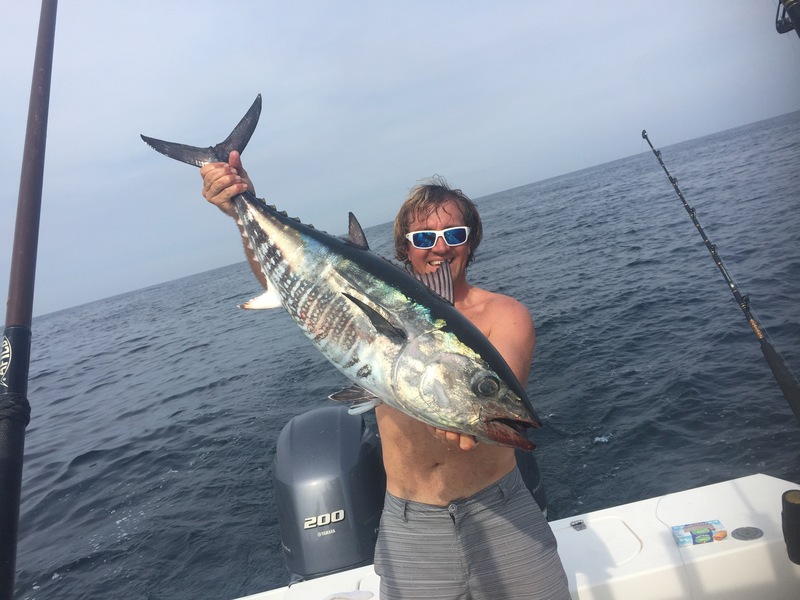 We gave it another 1-2 hours and picked up one more under bluefin (38″) on the way back blue and white again, put the fish in the boat and took off for home. Not bad for a 6 hour tuna trip! We ran to the Southern Lumps on the inshore fishing grounds searching for tuna on the chunk. We got anchored up at first light in clean green 80.5 degree water. Right away we got a mahi from the kite bait and shortly after we boated a nice 50# yellowfin tuna that ate a kite bait. We had to bring the kite in unfortunately as the wind dropped out completely. After about an hour and a half of no bites we got on the drift. 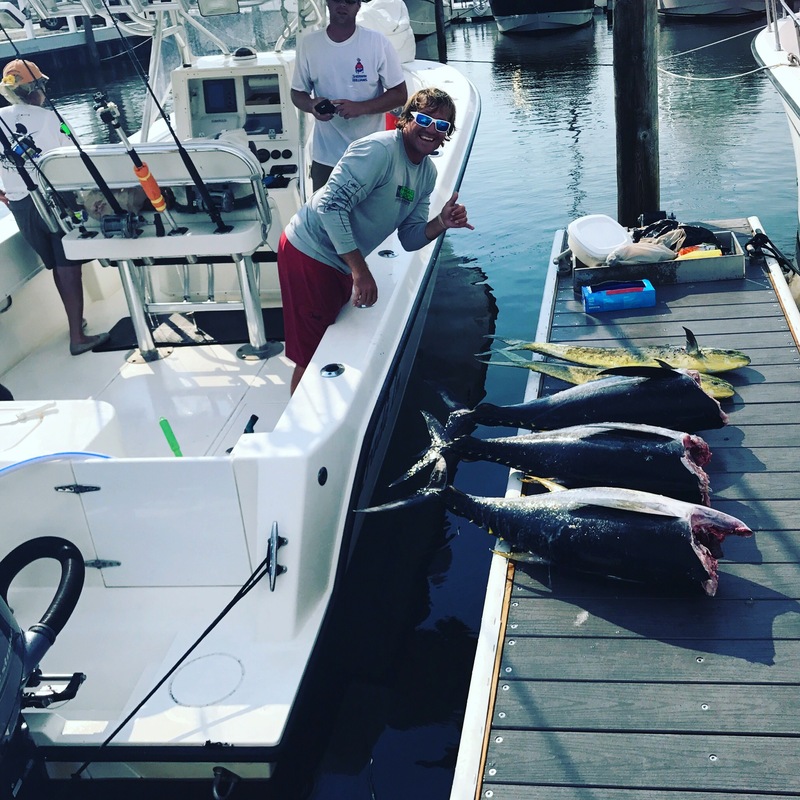 We were able to pick at bites throughout the rest of our day ending 3/5 on nice yellowfin tuna weighing 45-60 pounds and anothe mahi. The fishing remains tough all around so we were pretty stoked on our day and plenty of fresh meat! We ran an overnighter Sunday into Monday with Nick and Jane from Sebastian, FL. Nick was looking for his first yellowfin tuna. Fishing was very tough in the canyon and we only managed a couple throwback yellowfins, not what we wanted to get Nick. The water temp was 82 degrees and. Dry green. We covered a lot of ground looking for something different but no go. We found plenty of whales and porpoise but they weren’t doing much and we didn’t mark any bait at all. We did drop for some tilefish and put more then enough in the box for the dinner table. 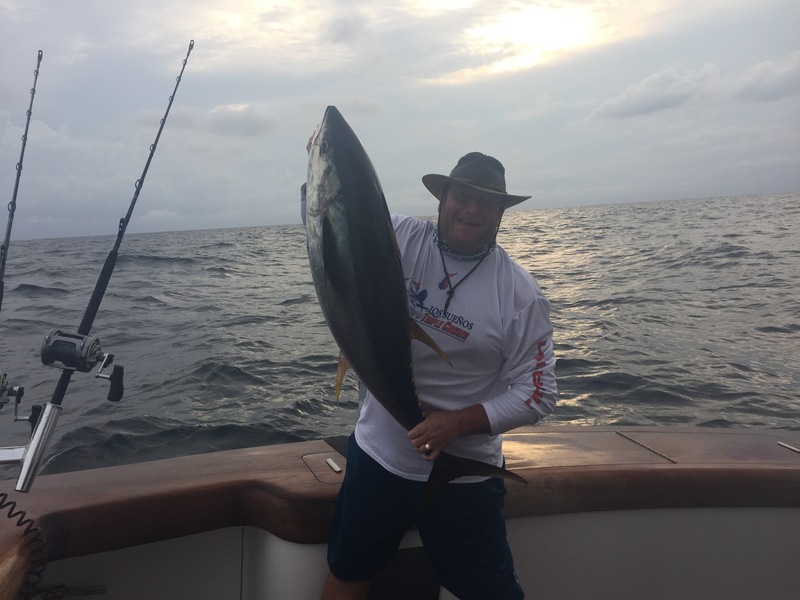 The night bite was nonexistent so we picked up and ran to the inshore lumps to the first light bite hoping the tuna would cooperate and we got Nick into this nice 40# class Yellowfin. We will most likely be pounding out the inshore lumps for tuna over the next week or so until something better develops in our canyons. Congrats Nick and thanks to Nick and Jane for making the trip up here. 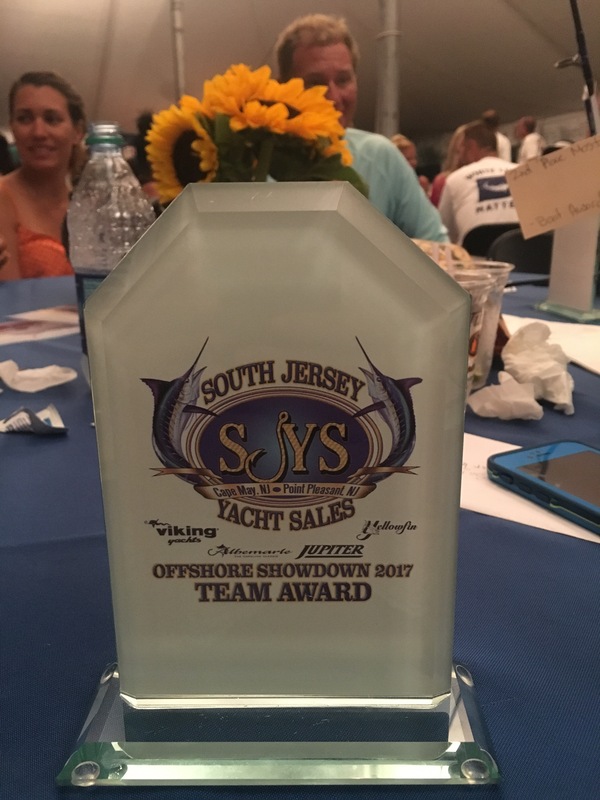 Today was day 2 of the South Jersey Showdown Tournament. We ran back to the NE Corner of the Wilmington and the there was plenty of squid on the bottom in the Flats. 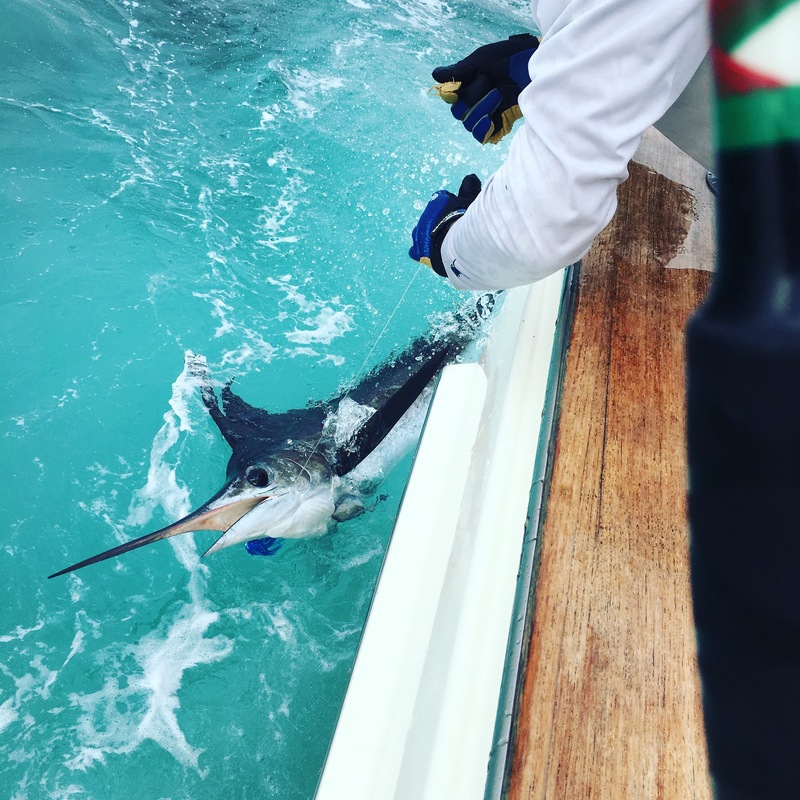 The water was green and 78 all day, and the current was pushing hard to the SW. We had 1 white marlin bite early on that we missed and that was it all day. There were some scattered tuna bites in there for the guys tuna fishing but otherwise pretty slow up and down the line. Since it was slow for everyone were were able to maintain our lead in the marlin points category so we got the Win! Today we ran to the inshore tuna lumps looking to chunk up some yellowfin tunas. We anchored up at first light in 79 degree green water and got the chunk slick started. It took about two hours before our first bite but we picked at fish all day until we left at 12:30 pm. We ended up hooking 12 yellowfins in the 40-50 poind range but due to having to use light leader we had quite a few pop off after a solid fight and we out 3 in the boat along with 3 mahi. Not bad at all. Good day that could have been great.